On Saturday, May 6, thousands of New Yorkers will again join their family, friends and neighbors at over 120 state parks and historic sites to participate in volunteer projects as part of the sixth annual I Love My Park Day, a partnership between New York State Parks and Parks & Trails New York. On behalf New York State Parks, I look forward to welcoming you all to what is a remarkable day for the New York State Park system. Sponsored jointly by the New York State Office of Parks, Recreation and Historic Preservation (State Parks) and Parks & Trails New York, I Love My Park Day is a statewide event to improve and enhance New York’s parks and historic sites and bring visibility to the entire park system and its needs. Public parks in every corner of the State, from Jones Beach State Park to Niagara Falls State Park, will participate this year. Volunteers will have the opportunity to participate in clean up events at five national parks in New York State: Gateway National Recreation Area (Great Kills, Staten Island and Plumb Beach, Jamaica Bay, Queens); Fort Stanwix National Monument (Rome); Roosevelt-Vanderbilt National Historic Sites (Hyde Park); Fire Island National Seashore (Ocean Beach) and Saratoga Battlefield Historical Park (Stillwater), as well as fourteen properties managed by the Department of Environmental Conservation (DEC) in the Adirondack and Catskill Regions and at three environmental centers, Catskill Interpretive Center (Mount Tremper); Five Rivers Environmental Education Center (Delmar) and Reinstein Woods (Buffalo). And, again this year, we will be joined across the state by members of the New York State Excelsior Conservation Corps (ECC), a New York State AmeriCorps program run by the Student Conservation Association, who will help State parks organize and implement I Love My Park Day projects. Each year, a record number of volunteers turn out and complete an impressive array of projects to beautify our facilities and prepare them for the summer season. Volunteers will celebrate New York’s public lands by cleaning up debris, planting trees and gardens, restoring trails and wildlife habitat, removing invasive species, and working on various site improvement projects. Your efforts demonstrate just how important your parks and historic sites are to your families, communities, and to our entire state as places to be active, explore the outdoors and relax with family and friends. It is our honor to work every day to ensure that all state parks are open and accessible for all to visit, but we could not do it without you—the volunteers and friends who work not just on I Love My Park Day but year-round to make our parks and sites the very best they can be. If you haven’t already registered, do so soon by visiting http://www.ptny.org/ilovemypark/index.shtml. Clean a beach, paint a cannon, build a boardwalk, fix a trail, wash electric vehicles, set up exhibits, install fencing for erosion control or rare species protection, plant native trees. These are some of the activities you can do during the 4th annual I Love My Park Day on May 2. I Love My Park Day started in 2012 as a continuation of the support and enthusiasm for New York State parks and historic sites when tens of thousands of New Yorkers rallied to keep parks open when they were threatened with closure in 2010. Since this beginning, I Love My Park Day has brought together New Yorkers from across the state, including Governor Cuomo, who share a goal of supporting New York State parks and historic sites through community service. Over 6,000 volunteers showed up for I Love My Park Day in 2014, 3,600 of which were new to state park volunteering. Those volunteers pitched in on more than 120 cleanup, improvement, and beautification projects at 83 state parks and historic sites. This year more than 80 parks and historic sites are participating in I Love My Park Day. Search and register for an event here. It’s a great opportunity to get outside and enjoy the camaraderie and look for signs of spring. I Love My Park Day is a joint program organized by Parks and Trails NY (PTNY) in partnership with the New York State Office of Parks, Recreation, and Historic Preservation and local park Friends groups. We hope you can join us for this stewardship day in New York State parks and historic sites. 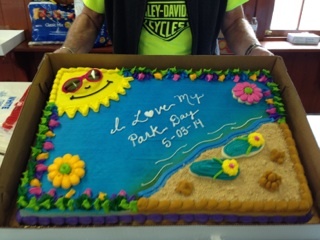 I Love My Park Day cake at Fair Haven Beach State Park.